Visitors could shift the angle of the viewfinder to reveal multiple perspectives of the real and imagined landscape. Together, the viewfinders of The Built/Unbuilt Square collected the stories, images, and numerous evolutions of the park in a shared frame. An accompanying installation of Rosenberg’s work related to this project was shown at the nearby Art Alliance. Rosenberg initially proposed The Built/Unbuilt Square as a speculative monument during Monument Lab’s discovery phase in 2015, supported by the Pew Center for Arts and Heritage. Partners: Mural Arts Philadelphia, The Pew Center for Arts & Heritage, The City of Philadelphia, Philadelphia Parks & Recreation, Friends of Rittenhouse Square, and Philadelphia Art Alliance. The Built/Unbuilt Square was presented as a part of the Monument Lab: Philadelphia (2017) exhibition. Rittenhouse is the only one of William Penn’s proposed squares to stay true to its original purpose, first depicted on a map by Thomas Holme in 1683, a proposed grid of the then-nonexistent city to attract English investors (all the other squares were at some point cemeteries and, in the case of northwest square, public gallows). Looking around the square today, one might wonder how this planned green space ended up containing so many disparate, and in some cases disharmonious, elements. The research attempting to answer this question revealed a great quantity of proposals built and removed, unrealized, temporary and partially completed: an unusual series of structures and events that leave the square with a confusing collection of fragments of mistakes, replacements, and long-forgotten intentions. My proposed monument acknowledges this site’s constant flux while subtly physically altering the square. What will it look like to see every proposal that has ever been documented for the square? What is it to experience the site today, absent the effects of time? Viewers will be able to look through and manipulate a pair of binocular viewers mounted on the northeast and southwest entrances to the square, facing inward. They will see a ghostly version of what has, could have been, and never was, all occupying the same space. Other than the viewing devices, a single physical structure will offer a hint to the vast virtual augmentation. With the aid of augmented reality and modified coin-operated binocular viewers, visitors will be able to see many structures that have been proposed for the site but never built, structures that have been built and removed, and a series of elements that have been altered or moved, all superimposed on the site as we find it today. 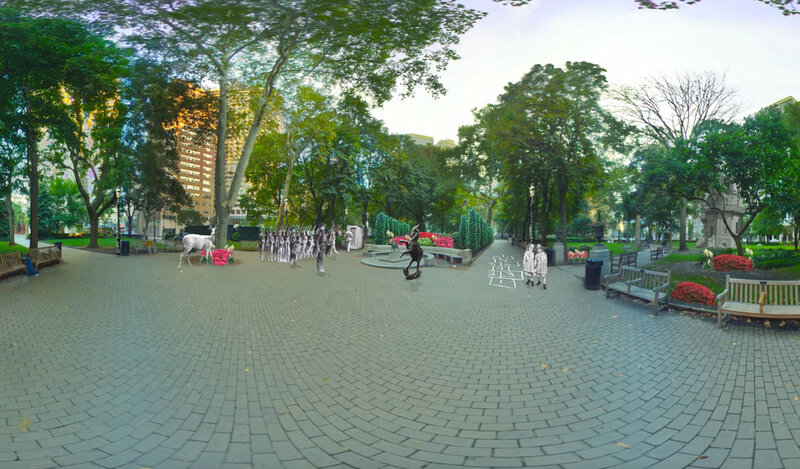 The Viewfinders in Rittenhouse Square allow viewers to look into the past. While playing a video, click and drag to navigate the environment. Alexander Rosenberg is a Philadelphia-based artist, educator and writer. He received a BFA in glass from Rhode Island School of Design and Master of Science in Visual Studies from Massachusetts Institute of Technology. His artistic practice is rooted in the study of glass as a material, in conjunction with broad interdisciplinary investigation crossing over into many other media and research areas. Alexander pursues his practice with artist residencies, teaching, performances, curatorial projects, and exhibitions locally and internationally. He is the recipient of the 2012 International Glass Prize, The Esther & Harvey Graitzer Memorial Prize, UArts FADF Grant, and the deFlores Humor Fund Grant (MIT). He has attended artist residencies at The MacDowell Colony, Urban Glass,Vermont Studio Center, StarWorks, Pilchuck Glass School, GlazenHuis in Belgium, Rochester Institute of Technology, and Worcester Craft Center. His writing has been published in Glass Quarterly, The Glass Art Society Journal, and the Art Blog. He is a founding member of Hyperopia Projects and heads the glass program at University of the Arts.